Last year, 75% of the trailers United Trailers manufactured were built with radial tires. Radial tires are widely considered superior to bias ply tires. Beginning in April 2015, all trailers we manufacture (with the exception of the XLE 4×6) will come standard with Radial Tires. “This is a significant improvement to the quality and performance of our entry level product line. While a substantial majority of our trailers we manufactured came standard with radial tires, we will now be installing these premium tires on all of our trailers including the entry level product line.” states company president Todd Bontrager. We hope you find this website to be a useful resource in the purchasing of a new trailer. Please do not hesitate to contact United Trailers should you have any questions. Trailer Acquisition Purchases Certain Assets of United Expressline, Inc.
Trailer Acquisition Corp., Inc.. is pleased to announce the purchase of certain assets of United Expressline, Inc. The new company was formed by the existing management team of United and is led by its’ president Todd Bontrager. 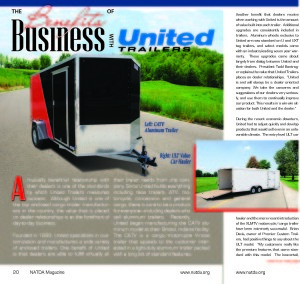 The new company plans to change its name in the near future to United Trailers, Inc.